Fine Arts Quartet specializes in chamber reductions of his keyboard concertos. Alon Goldstein. Photo from Goldstein’s website. The Fine Arts Quartet, (violinists Ralph Evans and Efim Boico, cellist Robert Cohen and violist Juan-Miguel Hernandez ) returns to the UW-Milwaukee Zelazo Center this Sunday afternoon for the third concert in the 2016-17 series. Pianist Alon Goldstein and string bass player Rob Kassinger will join the FAQ for an arrangement of Wolfgang Amadeus Mozart‘s Piano Concerto No. 24. Rob Kassinger. Photo from Chicago Symphony. Rob Kassinger plays bass for the Chicago Symphony. 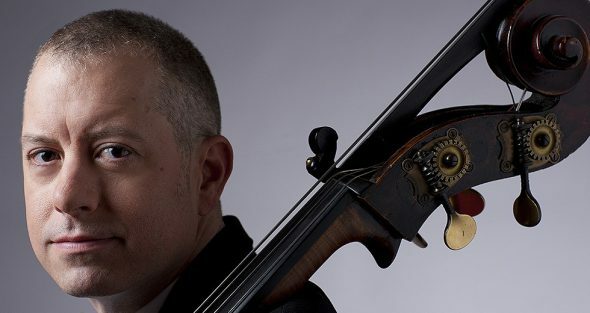 He is professor of double bass at DePaul University in addition to being a guest instructor at Indiana University. Although deeply involved with chamber works for bass, Kassinger has also developed a reputation as a jazz player. Evans found the reduction scores in a library in Australia. The transcriptions were written by Ignaz Lachner in the mid-19th century. The piano part is basically the same as the original, with the quartet representing the full orchestra. The addition of a bass player adds depth to the sound of the chamber strings. Evans and Boico carry the themes on violins. The three lower registers – viola, cello and bass – often provide a basso continuo-like platform. The pianist must play with a light touch as he is partnering with a smaller group. The concert will also include a late Dmitri Shostakovich quartet, String Quartet No.11, Op.122 (1966). Shostakovich had worked for four decades with the Beethoven Quartet, who premiered 13 of his quartets. When second violinist Vasily Shirinsky died, Shostakovich wrote a quartet in his memory. Shostakovich choose to break the quartet into seven distinct movements, although they are played in a continuous sequence within approximately 16 minutes. A slow introduction is followed by a mechanistic rhythmic scherzo which morphs into a highly dissonant recitative, a rapid bright etude and a humorous interlude. A longer elegiac adagio and a calm, mournful finale complete the work. I find the emotional arc of the quartet well served by the rapid changes of mood from movement to movement. Three works with tragic dimensions seem appropriately chosen, for the Fine Arts Quartet appreciates the power of deeply moving music. Works by Mozart, in particular, have been cherished by the FAQ for the juxtaposition of beauty and sadness – evidenced by both works on this program. The Fine Arts Quartet will offer their next concert in the series Sunday, April 30. Piano duo Fabio Witkowski and Gisele Nacif Witkowski will join the quartet. Individually they will participate in a Robert Schumann Piano Quartet and Piano Quintet. The duo will play a set of piano dues featuring Brazilian composers Heitor Villa-Lobos and Francisco Mignone as well as contemporary Spanish composer Antón García Abril. information about the Mozart on the program next will be richer musically for it. Thanks.